What happens when you get 40 content designers in a room? We tested this theory at the content design meetup in Newcastle on Tuesday 21 June and learned about accessibility, user research and forms. 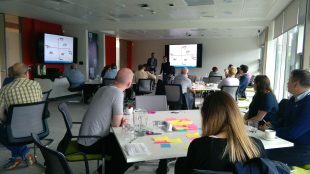 We had people from 11 organisations across government, including the Department for Business, Innovation and Skills (BIS), the Department of Work and Pensions (DWP), HM Revenue and Customs (HMRC) and the Government Digital Service (GDS). Different types of users have different barriers to perceiving, understanding and using content. Removing those barriers makes it easier to ‘do the thing’. As content designers, when we understand the barriers and the technology people use to overcome those barriers, we can make it easier for everyone. David McCrae and Graeme Claridge ran a workshop for content designers to practice creating content based on interviews with users. We split into teams to go through the interviews and pull out the important points. We then put the points on post-its, grouped them and prioritised user needs. Using our prioritised needs, we wrote a page to get users to sign up for a new service. Working through this process in an hour was a bit of a race, but increased my confidence and understanding of the process. Caroline Jarrett’s session on forms at the last content conference left standing room only. So we asked her to run another one in Newcastle. HMRC very kindly offered up a form they were working on for charities. By coming to the form with a fresh pair of eyes, we were able to see what questions would be good to ask in user research sessions. Lucy Hartley from GDS and Jeni Pitkin from BIS showed large content improvement projects they’ve worked on. Lucy talked about her work on the import/export project alpha and how GDS is trying out a new way of managing larger content projects. Jeni came to London for 4 days to work with a small team at GDS to improve guidance for people starting a business. One of the issues this project threw up was how hard it is for someone starting a business to wade through all the content on GOV.UK to find out what they need to do. The team had a short amount of time, so focused on high-level content and restructuring the main browse page. By adding headings and ordering the content, the call centre got 20% fewer calls from users who previously couldn’t find what they needed on GOV.UK. This meetup felt very different to the last one I went to in Nottingham. We were in a brand new building, with tea and coffee and biscuits and cake, which was great! But we weren’t allowed to put up post-its or stick anything to any vertical surface. Getting content designers together is always helpful. It helps to talk about our problems, and someone almost always has a solution. It helps me to put faces to the names from our Basecamp community. With stronger networks, content designers work better and get more support. So if you want to run a meetup in your area, get in touch. There’s loads of ways to run one, and lots of ways to get involved. Sorry about the no post-its or sticking anything to vertical surfaces - not an HMRC rule but one imposed by our landlord. Lesson learned - roll a few whiteboards over to the Business Events Centre next time.